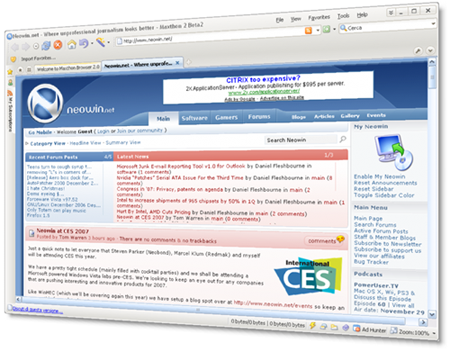 The release of the new Avant Browser has given many people a great option to switch to it and stop using Microsoft’s Internet Explorer. The Avant Browser is very fast and is highly recommended for those who use Microsoft products and engines but want to move away from the heavy features of Internet Explorer. With neat built-in features and options for interface customization, Avant Browser is created to allow users to view multiple websites simultaneously and to prevent the undesirable Flash advertisements and pop-up windows from appearing. It also has automatically built-in Google and Yahoo search engines, which are two popular engines with good performance in searching internet information by the user. With its integrated cleaner it also clears the history of pages and maintains the privacy of the user. The deleting of traces of auto-complete passwords, search keywords, typed addresses, cookies, and temporary internet files will be automatically done when using the Avant Browser. And if your computer shuts down improperly, or you lose your connection while browsing, the Avant Browser opens the web pages you were browsing right before the shutdown of Avant Browser and are reopened when Avant Browser is reloaded. Proven adequately fast in loading web pages, the Avant Browser is also preloaded with at least 24 skins. The browsing window is tabbed for each web page. One neat feature is the modular toolbars will allow you to hide or move the search window, the navigation controls, or the status bar. Try Avant Browser now if you are tired of the slow features of Internet Explorer but are still a fan of Microsoft products. Users of Avant Browser will be able to access personal information from anywhere they are at. They don’t even have to worry about ever losing this same information when they are suddenly required to re-install Microsoft Windows at any time. With this nifty feature, RSS Feeds, web passwords, web configurations and bookmarks are all saved in Avant Online Storage, which has proven to be a safe way to keep and remember your personal information while you surf the internet. It can be noted nowadays that almost all banner advertisements are created on Flash and many of these appear on web pages you want to browse. But not all of us want to view and load a Flash banner advertisement. The neatest feature of Avant Browser is that you can completely block these annoying Flash banner ads that don’t even have to load before you can further browse a web page of your choice. Check it out and see how much bandwidth you can save by blocking these Flash advertisements and focusing on what is really important on the web page you are looking at. And since Avant Browsing can also block other unwanted files and components that slow down web page downloads, its options will enable you to control the speed of the loading of web pages as well as control the bandwidth used for each web page. With other small and ingenious features like clicking on the middle mouse button and opening a link in a completely new window in the background for forums (for instance) makes Avant Browser an efficient tool to use while internet surfing. It also has other neat customized mouse clicks which will make navigation of the web pages of interest so much easier! Use the Full Desktop Mode on Avant Browser to make loading pages clearer and bigger. Also, with its built-in RSS/ATOM Reader, you can bookmark your favorite feeds and allow you to browse them the same way you browse web pages! Since it is fully compatible with Internet Explorer, the bookmarks that you have in your existing IE program are automatically imported into Avant Browser at your own whim. So, try out Avant Browsing now for a more enhanced browsing experience! Avant Browser Free Download - we do not host any Avant Browser torrent files or links of Avant Browser on rapidshare.com, depositfiles.com, megaupload.com etc. All Avant Browser download links are direct Avant Browser download from publisher site or their selected mirrors. Avant browser is more like my friend. Fast, stable, useful. It's the most stable version after 11.7.46, no freeze,no close accidently,no strange errors,just like a knife customised for me. i give avant four stars .i think avant browser can be better than now . it is said that orca and chrome's ken will merge into avant browser .